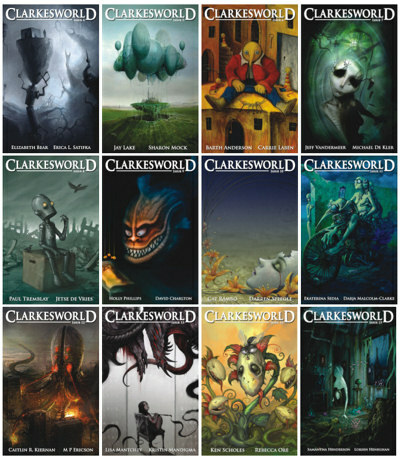 Vote for the Best 2007 Clarkesworld Magazine cover. I’ve said it before and I’ll likely say it again, you have the best covers out there. I’m glad to get a chance to cast my votes on them. You’re kidding, right? THEY ARE ALL PERFECT COVERS. You have the best covers in the business, bar none. 🙂 Thanks! I gave people three choices because I had a hard time picking one. I’m not voting, but it should be interesting to see if people pick the same ones I did. Thanks for giving us three. Does make it easier (though not necessarily easy). they all ROCK! But maybe the little robot sitting on the box is my favourite. Thanks Will! I miss having all the magazines coming in. I’m a short story junkie, so it’s been quite an adjustment for me. I like Mythos stuff, and you have a few titles I hope to pick up, as soon as finances allow. Also, would you have any insight as to where I might find Wicked Hollow 2-4? I still watch for those, and it’s a shame Jon disappeared. His was a good act, indeed. I don’t think I’ve ever scene Wicked Hollow 2 or 3. I may have had a copy of 4 at one point. I keep hoping that he turns up sometime and does another.